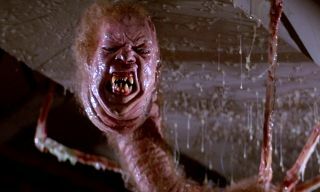 "The Thing" cuts a memorable figure in John Carpenter's 1982 film. Some aliens in science fiction are truly the stuff of nightmares. The torso-bursting monsters of "Alien" are one example of things we hope don't exist. Other aliens of science fiction to avoid include the insect beings of "Ender's Game," the blob in "The Blob," the alien life-form in "The Thing," and even the "mog" (half man, half dog) in the comedy "Spaceballs." While we can't forget the many beneficent aliens of fiction, monsters are what truly fascinate us because these beings best represent the fears of exploring the unknown. Monsters can also serve as a proxy for why you may not want to land somewhere, such as the beings that kept attacking the poor crew in "Europa Report" who dared to visit an icy moon of Jupiter. Indeed — fictional monsters are the focus of Episode 3 of "AMC Visionaries: James Cameron's Story of Science Fiction," airing tonight (May 14). "Monsters are fascinating because they terrify us. Alien monsters are especially fascinating because they terrify us, and we know they could be real," Samuel Levin, a doctoral candidate in zoology at the University of Oxford, who recently co-authored a study on what aliens could look like, told Space.com in an email. "Some people find swimming in the deep ocean terror-inducing, and when you ask them why, they say 'because anything could be down there.' By 'anything' they mean sharks, rays, fish, etc. But our Earth floating around in the big dark universe is a bit like that. Anything could be out there, and that gives the author of science fiction a lot to work with." Science fiction authors can also use our fear of aliens to explore themes that have implications for humanity, he said, such as race ("District 9"), religion and free will ("Sirens of Titan") or the difficulties of translation ("Arrival"). But as far as we know, alien monsters remain just that — metaphors for what the worst of humanity can be. The real aliens of the universe probably look nothing like how we could imagine, Levin said. While they will follow the same laws of natural selection as us, they will likely be easy to spot only because they are complex and that they have a purpose — such as eating food — that rocks or gases lack. They probably will have difficulties even communicating with humans; imagine if their "sight" was in the X-ray spectrum, or they used electrical currents for navigation instead of sound, touch and sight. First, researchers need to know where to look. "Common places to look have been planets that are the right temperature for liquid water (or liquid something), and lots of scientists are trying to figure out what chemistries might be possible for life, which will help narrow our search for other planets and moons," Levin said. "I think we ought to be cautious here, as natural selection is a very powerful force for pushing life, once established, into harsh climes." Of course, science fiction has its horror stories as well for microbes. A quick glance at recent films ("Life" and "Alien: Covenant," for example) shows humans reacting very badly after coming in contact with foreign microbes. Historically, NASA has been concerned about this, too. The agency put the first few Apollo crews into quarantineafter they landed on the moon, even though there was little to no chance of microbes surviving on the radiation-baked, airless lunar surface. For traveling to Mars, NASA has extraterrestrial protection protocols in place to lessen the risk of contaminating the Red Planet — or having microbes contaminate us. These protocols include carefully sterilizing spacecraft, and trying to avoid regions that may have running water (such as recurring slope lineae, which are dark streaks researchers have spotted on the walls of craters). The agency also tries to be careful around icy moons in the outer solar system that could host life near hot vents, just like on Earth. For example, NASA deliberately threw the Cassini spacecraft into Saturn last year on the off chance that it would slam into Enceladus, a geyser-spouting moon that may have icy water. NASA did the same for the Galileo spacecraft in 2003, since there was a tiny chance it could crash into the icy moons Europa, Callisto or Ganymede. When trying to think about where microbial aliens may reside, scientists often look to analogs on Earth to help them better understand. Harsh desert environments, salty water and acidic underwater vents are some "extreme life" scenarios that researchers examine, although the limits of life still may not be known. James Cameron talks to Guillermo del Toro in Episode 3 of "AMC Visionaries: James Cameron's Story of Science Fiction." Scientists have found a few possible habitable planets around red dwarf stars, which are smaller and dimmer than our own sun. Planets need to huddle closer to the star to maintain liquid water than they would to sun-like stars. But proximity carries its own dangers, as red dwarf stars are prone to belching out radiation that could fry life on the surface. So the debate over habitable zones continues. Lisa Kaltenegger, an associate professor at Cornell University, focuses her research on potentially habitable rocky planets and "super-Earths" (planets that are slightly larger than Earth). She suggests that a habitable planet may have certain characteristics that a super-powerful telescope would see. The James Webb Space Telescopethat launches in 2020 is powerful enough to examine Jupiter-size planets, but to examine rocky planets researchers would need a future observatory that is more tuned to look at (comparatively) tiny worlds. For those tricky red dwarf stars, Kaltenegger said, maybe life has found another way to survive. On Earth, there is algae that can deal with UV radiation through a process called biofluorescence; perhaps a similar thing exists on a rocky exoplanet. "If you hit the coral, it breaks down the UV to visible light. That's not as damaging, and it fluoresces," she told Space.com. "The way I love to think about it is in a planet with vast oceans, the star is flaring, the flare is hitting the ocean and the ocean is lighting up." She joked that because some of the beings in Cameron's "Avatar" were bioluminescent — able to produce and emit light — that his planned sequels should explore worlds with their entire oceans fluorescing in different colors. "Cameron should put it in his next movie," she said. Life could also show itself through the combinations of gases in its atmosphere, particularly if methane and oxygen are in abundance, she said. These are gases that otherwise would naturally react to carbon dioxide and water and dissolve — so something may be constantly generating them to replenish the supply. The caveat, though, is that that process may not be biological; geology could also somehow be producing the methane and oxygen. Kaltenegger added that scientists will need to be cautious when encountering possible extraterrestrial life to make sure they are not fooling themselves into thinking something else is presenting itself as possible life processes. "Extraordinary results require extraordinary evidence," Kaltenegger said of assuming life exists elsewhere. Her words paraphrased former Cornell astronomer and science popularizer Carl Sagan, who died in 1996. This story was inspired by Episode 3 of "AMC Visionaries: James Cameron's Story of Science Fiction," which airs tonight at 10 p.m. EDT/PDT (9 p.m. CDT). A companion book is available on Amazon.com.